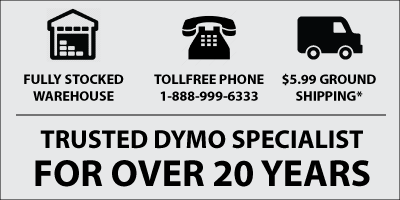 The Dymo 30252 label size dates way back to the 1990's - it was one of the first ever LabelWriter label sizes made. Initially developed (and named) the Address label, the 30252 was meant for Addressing envelopes. Although that is still it's primary use, there are so many other purposes that it is used for today. So what else can you use the Dymo 30252 size for ? A common use is for labelling and barcoding documents. An example would be in a hospital. When a patient is admitted, a bunch of labels are printed which would most likely contain the patients name, DOB, an ID number and a barcode. These labels are affixed to the patients file folder and various documents. In this case we would recommend the Labelcity 120350 Address Label. It is a paper label with a permanent adhesive. Another use would be as a warehouse shelf label. In some warehouses, a label is created for a shelf location that contains a product description and a barcode. In other warehouses, the label would contain a location number only, and again a barcode may be included. Either way, the Dymo 30252 label size is perfect because of it's slim but relatively long dimensions. For this purpose, we would recommend the Labelcity 120260R Removable Label. Using a 'removable' labels means that you can change the label frequently (as the product on that shelf changes) without having to deal with sticky residue that could be left behind when peeling off a label with a permanent adhesive. One more use would be a Name Badge. Typically we recommend Dymo's specifically designed Name Badge Labels, but if you wanted just a slim little label that maybe contained the persons first name only, the Dymo 30252 label size is a perfect match. We'd recommend the Labelcity 120350 Address Label for this purpose.